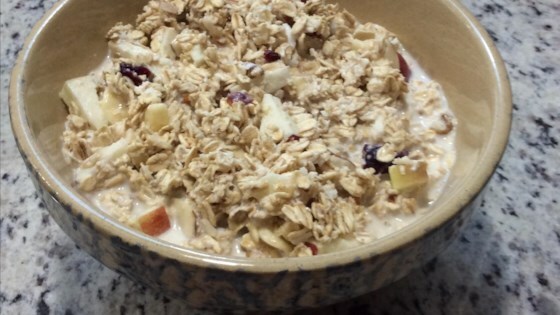 "This is a great breakfast that you can grab fast in the morning. It goes great with a hot cup of coffee. It also keeps very well so you can make some on Sunday night and enjoy it all week!" Mix oats, apple, milk, yogurt, banana, raisins, walnuts, almonds, brown sugar, honey, and orange juice together in a bowl. Chill in refrigerator for at least 1 hour to set. The sweeteners aren't needed, the fruit makes this sweet enough! I used fresh coconut for part of the nuts in the recipe. Great breakfast! Delicious. I make this on Sunday and have breakfast for the week. I like to add a generous splash of milk each morning and stir that in to get my desired consistency. Love to make this in smaller mason jars or any clean empty jars. I like to add blueberries and bananas to mine. Great breakfast to grab and go.